1.Take a white 5x7 card blank and cover with a piece of silver mirror card cut to 11 x 15cm. 2.Cut a rectangle of white card to 10.5 x 14.5cm, run the card through the Helz Cuppleditch Winter Woodland Wreath Embossing folder, remove and then ink the embossed card using a sponge. When dry add spots of glitter on the berries. 3.Add a length of glitter ribbon to the bottom of the card and using more of the same ribbon tie a bow and glue down on the ribbon strip. 4.Stamp your sentiment on a piece of white card and ink the inks to match, finish your card with three coordinating pearls in the top right corner. 1.Cut a piece of white card to 15 x 15cm and cover with strips of washi tape, once fully covered, mount on a 6x6 card blank. 2.Trim a rectangle of red card to 14 x 10cm, and using the Me to You Doily Embossing folder run the card through your die machine, fix to the left hand side of your card. 3.Stick the Me to You Tatty Teddy Present sticker on white card and trim to a 6 x 10.5cm, mount of green backing card leaving a 5mm border, fix in the centre of the card using foam squares. 4.Finish the card with a sentiment topper, accordion sticker and a trio of gems in the top right corner. 1.Use a 5x7 craft card turned landscape and cover with red gingham paper cut to 17 x 12cm. 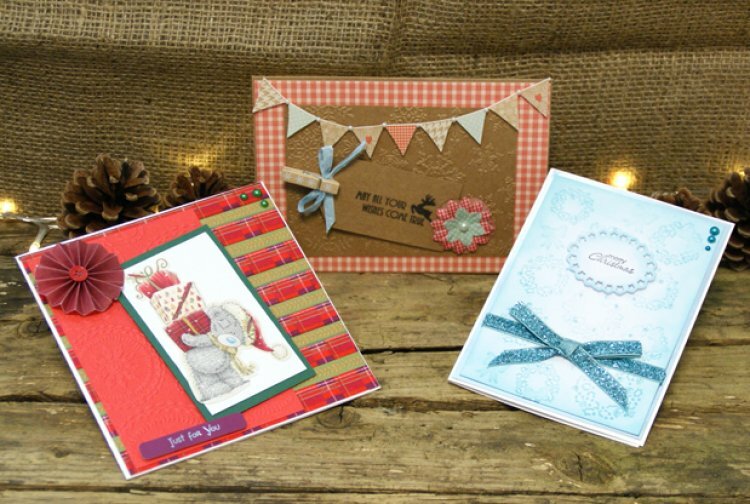 2.Cut a piece of Kraft card to 11 x 8cm, using the Dovecraft Krafty Christmas Embossing Folder, remove and glue down onto the centre of the card. 3.Cut a row of bunting so you have 9 flags and stick across the top of your card, add small pearls in-between the flags. 4.Cut a tag out of Kraft card and stamp with the sentiment, tie a bow from ribbon and secure to the tag using a wooden peg. Fix to your card using foam squares. 5.Layer two paper blossoms and stick to the edge of the tag, add a pearl to the centre of the flower. Using embossing folders can turn an ordinary card into a stylish work of art, have fun mixing layers and textures on your projects. Upload & share your embossed folders to our project gallery.